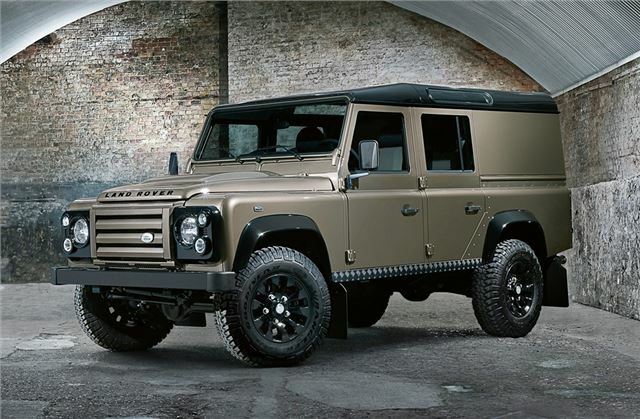 Land Rover has unveiled a new special edition Defender called the XTech. On sale now and priced from £27,995, the new model stands out thanks to a choice of either Orkney Grey or Nara Bronze paint with contrasting Santorini Black roof, wheel arches and black chequer plates along the bumpers and sills. Available as a Defender 90 Hard Top or a 110 Utility Wagon, the XTech also gets 16-inch gloss black Saw Tooth alloy wheels and MTR off-road tyres along with a body coloured grille and black headlight surrounds. Inside there is Ebony part leather upholstery with contrasting Lunar stitching while the central panel matches the body colour with the same paint finish. The XTech Special Edition comes with a high level of standard equipment, including air conditioning, Electronic Traction Control, central locking with remote control, heated seats and a heated windscreen. Like the rest of the Defender range the new XTech is powered by a 2.2-litre diesel engine with a six-speed manual transmission, developing a maximum of 360Nm of torque.